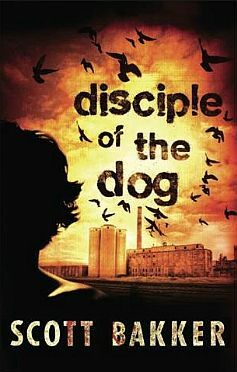 Disciple of the Dog – Scott Bakker | The Cesspit. The pain with this book more than reading it is trying to write a review. How to frame it? It left me reeling for sure. There are a number of ideas explored that seemed to echo with some my own thoughts pre-existing the book, this further reflected toward the end of the book by a strong in and out of text deja-vu whose implications are far too tangled for me to make any sense of them (I should also try to second-guess some that Bakker did, that would bring a whole new level of complication). Just to say: the book messed a bit with my head. But that was almost expected, knowing well the kind of writer. The blending in and out of character, in and out of the book, and between facets of different characters echoing each other is a prevalent defining trait. I’ll try to introduce things. This is a lean book, 249 pages, written in first-person by a private detective that at once fills the canon and pushes it beyond extreme. Bakker is the kind of writer that when sees a boundary pushes down on the accelerator. What’s absolutely banished and tabu is any idea of moderation or compromise. But in the beginning we have the broke and cynical private detective with his filthy office next a filthy road, who fucks his secretary and is a smartass all around. Very anti-hero. Very pulpy, very effective in positioning itself in a category easily recognizable. The story in the book will be about investigating the case of a missing attractive young woman that was caught in a religious cult of weirdos who think the world is about to end and that everyone of us is only playing a role on the stage of a fake theater. All Matrix-like (including the technology, but don’t focus on this distracting element). The catchphrase supposed to sell the book is: “Imagine being able to remember everything you’ve ever experienced.” That’s the peculiarity of our detective but, voided of its implications, only sounds as quirky and not all that potentially intriguing. I’m sure the cult’s belief is much more seductive for the occasional reader. We, “normal people”, perceive expressions and attitudes of others like something transitory, while the people themselves are real and come first. But for him, his perfect memory makes him recognize the same expressions and attitudes across different people, to the point that it’s those expressions that he recognizes and categorizes, while the people themselves become transitory. People that appear as collections of deja-vus and known patterns. People that repeat. Masks. Oblivious actors playing a role, rehashing over and over. Bakker is more known as a fantasy writer. “The Prince of Nothing” series I’ve recently started to read. Facing Disciple Manning, the cynical detective of this book, is the same as facing Kellhus, the prophet from The Prince of Nothing. In the prologue of that book Kellhus meets Leweth, a guy living a solitary life in a forest. In the short time they pass together Kellhus “lifts the veil” on Leweth’s life and makes him realize that his life was all built on lies he fabricated by and for himself. With that realization comes the death. Ignore the Merge sign long enough, and sooner or later somebody gets killed. Truth destroys, it doesn’t heal. Breaks you. Forgetting is healing. Even the idea that “truth” is desirable is a conceit, a lie we tell ourselves. The point is: we are hardwired to be stupid, to be hypocrite. Hypocrisy implies a certain amount of forgetfulness. To forget all those things that can’t be manipulated to our own advantage. The brain shields from truth, it has safety triggers so that we can lead a functional life. Truth instead has the power to “dislodge”. The insight you gain is dangerous and may well destroy you. Once it’s done there’s no Matrix-like blue pill that can save you. You stop working the way you’re supposed to, think out of the frame and you’re doomed. You bit the apple from the Tree of Knowledge: God hates you. (Hint: David Foster Wallace didn’t survive himself, Hal in Infinite Jest freaks out once he becomes too aware and can’t sort things anymore. People break all the time when they start seeing too much. Insomnia is the state of the mind when it works too well for its own sake.) Living with a perfect memory corresponds to see the horror, without pause. Every instant. You can’t filter, sort, select, reinterpret. You can’t find a way out that makes life and suffering bearable. You can’t find meaning, belief or excuse. There’s no place to hide from yourself. I sit in perpetual judgment. But it’s through understanding that you see all the flaws as necessary and justified. Stepping back, it’s like Bakker himself is trying to pick flaws in his reasoning, try every possible perspective to find a breach, whether through cold reasoning or through defiant irreverence and constant scorn, but the result is all the same. “The Framers” is the name of this religious cult and their belief becomes a very slightly distorted version of what Disciple represents. They have two opposite stances, him and the cult, appear as adversaries of opinions, but soon you’ll see how the two different perspectives overlap and match almost perfectly. Disciple sees people as actors and collections of deja-vu. Self-deluding machines who build their own conceits and prosper in false belief. The Framers believe that everyone is an actor with no perception of the actual “true self”. The difference is merely in context and visualization. Where Disciple stops at showing the conceit without providing answers, The Framers “dress” it and contextualize: the world is about to end and we live a dream as the only way to escape. I’m aware that Bakker’s first effort out of the fantasy genre, Neuropath, was criticized because it was too much “theory” and not enough story and characters. As if reading like a textbook. What Bakker achieves in this book is about soaking the theory into something concrete and available as direct experience. You don’t have to chase the writer through pindaric flights that are hard to follow, everything is grounded in the matters at hand, contextualized, practical and pragmatic. This book drops all frills and decorations, all diversions and derails, it goes straight to the point. Its strength is in the lack of hypocrisy that is built-in the narrative voice. The writing is teeth and nails, it goes for the bone. It’s stripped of everything superfluous and that way it’s much more effective and searing than his fantasy series. It goes to the point in the first three pages, that work like a manifesto for the rest of the book. This to say: it can’t feel any more authentic and direct. It pulls no punches. On the other side, the type of journey isn’t that of typical thriller even if all the elements of typical thrillers are all present, done cleverly, and fully delivered, including a number of surprises and reversals in the last few pages (20 pages from the end one feels hanging from too many threads, but they are all wrapped up neatly, while also leaving space for thought once the book is finished). It’s still heavy in introspection and the plot itself moves slowly. Most of the surprises that build the bigger block of the book are all on the very subtle side, while true surprises that bend the plot only come to enliven the finale. What drives the book and makes it so brilliant that it won’t possibly bore is the “insight”, the depth and incisiveness of observation, and, especially, the sense of humor that holds all of this together. A sense of humor that is obviously nailed on the character, so filled with cynicism, awful puns and shocking, outrageous commentary. I’d say that this is one of the most, if not the most, extraordinary books I’ve read. Literally. Extra-ordinary. Far from whatever you may have read up to this point. You just can’t find (easily?) a book like this and I can imagine it won’t easily find its public. Not everyone likes to be punched right in the face. Many, and it’s not a fault, read to be lulled, Bakker instead messes with you and tries everything he can and then more to shake the reader. His writing is subversive to the core, outrageous and irreverent. Filled with venom. Disciples says as much: “I’m not safe. I’m poison.” And he doesn’t do this as a tease, but because it’s true: you’re warned. This book lifts a few veils, it all depends if you really want to see what’s beyond. There are risks. It isn’t fun, and it’s not pretty. There is also a dearth of answers. God’s greatest trick was convincing the world that belief was hard.